Happy New Year everyone! Here’s looking at a great 2012. We love old hot rod photos, especially with 97s in ’em. You can learn so much. So we thought we’d start the year with something cool we’ve had hanging around here for a while from our good buddy Tony Thacker, Director of the NHRA Museum. Four super-cool early, wire-wheeled, ’32-grilled hot rods, all with two high-stepping Stromberg 97s a piece. Don’t know much about them (ie nothing!) but they’re clearly pretty ancient. My money’s on the late ’40s. And clearly at some influential locations. I am sure I have seen that car in the top right photo before. That hokey, grafted-on closed car screen surround rings a bell. Early pump-in-head engine with polished ally heads, and an agricultural steering box mount – I wonder what reception you’d get with that at this year’s Father’s Day Show? The ’32 at top left has a Duvall-style screen by the looks of it. And maybe the bottom right car too – check out the chrome front spreader car, painted hubcaps, chrome head bolts and unfilled grille. This dude was styling’! I’m even wondering if those 97s are chrome…. 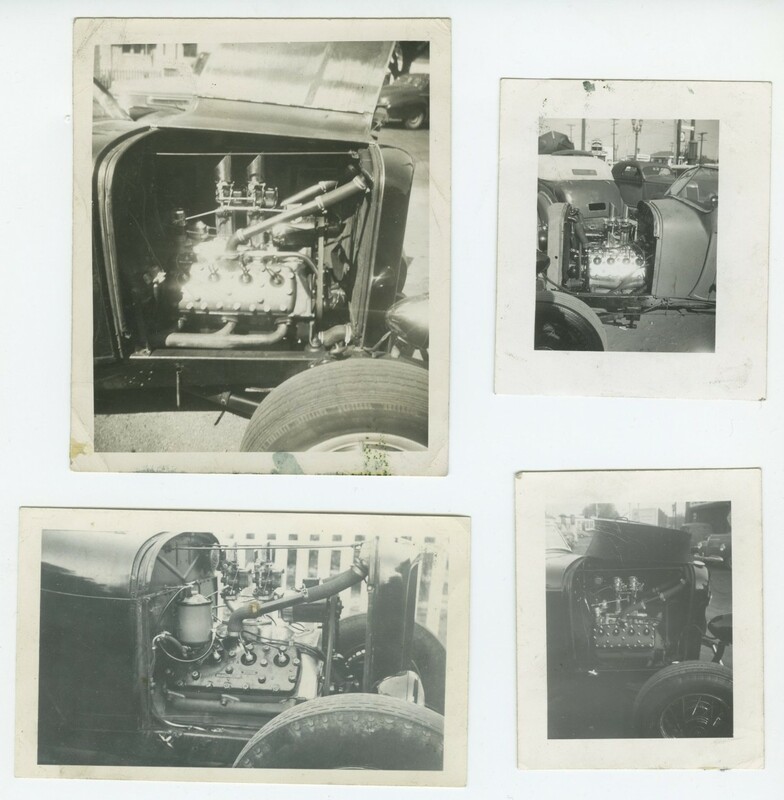 This entry was posted in Other cool stuff and tagged flathead, hot rod, intake, Stromberg by Clive. Bookmark the permalink.